Phyllis loves to share recipes from her 'Down Home Recipes Box', which has recipes handed down from three or more generations ago. Chuck steak has a very good flavor, but can be tough and hard to chew if not cooked properly. It is one of the more economical cuts of beef. Many people will avoid buying it because of the amount of fat and gristle in it -- yet this is what makes this cut of beef so flavorful. 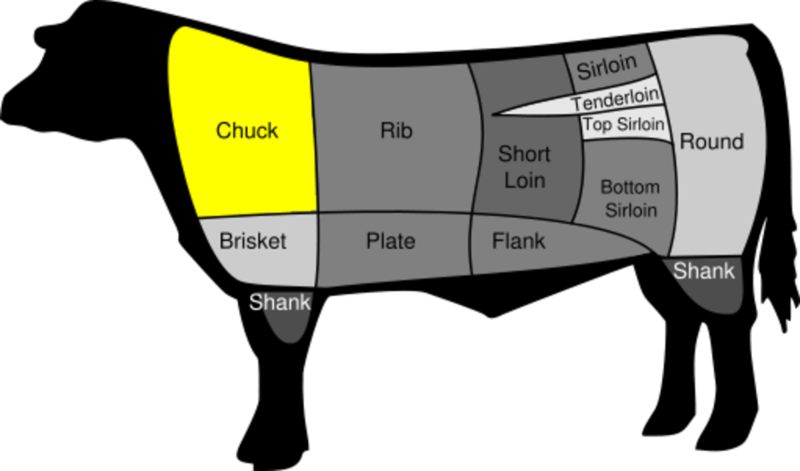 The cut comes from the shoulder and neck area of beef. I have found the best way ever to make the steak so tender and tasty that everyone will praise you as the best cook around. Baking while steaming seems to be the trick. Years ago this cut of beef was called "seven bone steak". 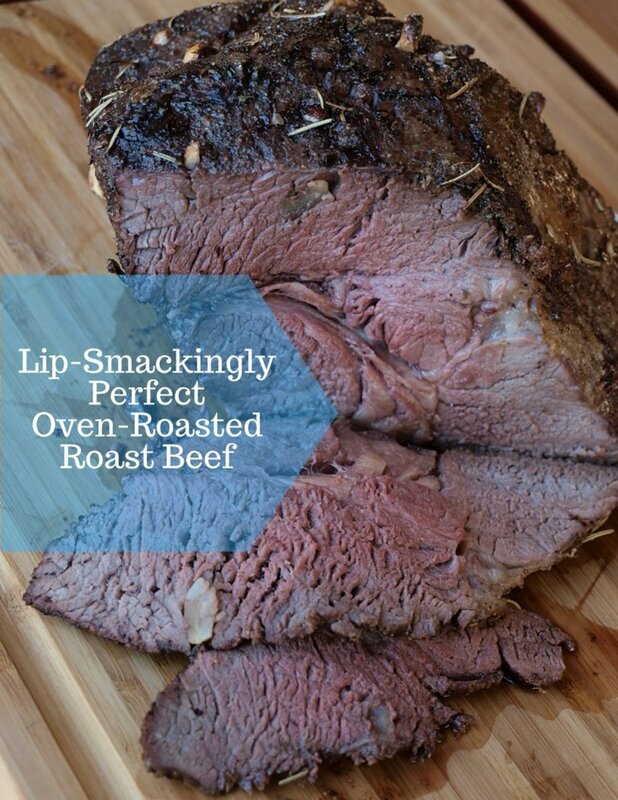 My mother used this cut to make her delicious pot roast. She added water to about an inch from the top of the meat and kept it at that level throughout the cooking process. The juices from the meat made a wonderful broth. About 30 minutes before the meat was done, Mom added sliced carrots to the broth. 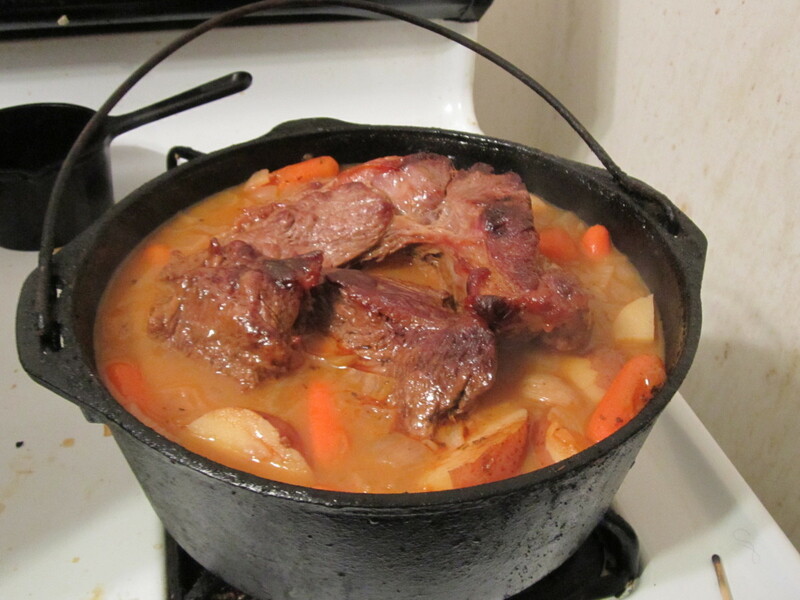 When the carrots and meat were done, she removed all the broth to a large cast iron skillet and made a dark, rich gravy which was poured back into the roasting pan. Then she added one or two cans of peas. This wonderful dish was served with mashed potatoes. When Dad served up each of the nine plates at supper, he made sure everyone got lots of gravy on our potatoes. We had to wait till everyone was served and prayers were said before we could eat. By that time our mouths were watering and we were starving - so did justice to Mom's delicious supper. Sometimes Mom would make it a little easier on herself and make the pot roast "Yankee style", by adding the potatoes to the roasting pot. 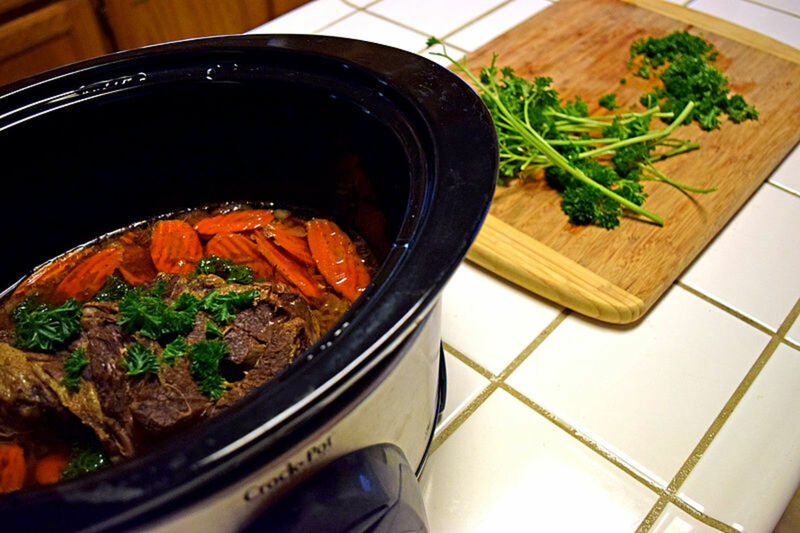 I like to use a slow cooker to make this meal. Mom's pot roast supper was excellent and I still make it once in a while. 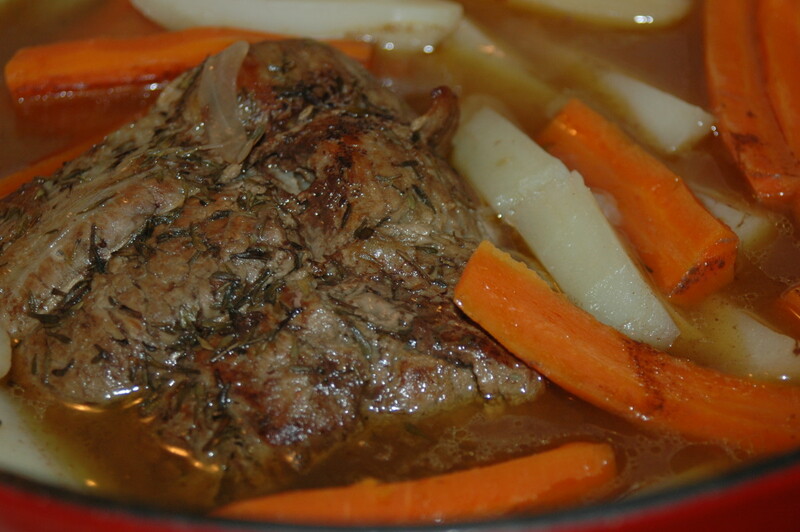 My version of pot roast is quite different and also an excellent, tasty supper for hungry folks. This recipe will serve four to six people, depending on how hungry they are. I have a large extended family and when we are all together this dish is a great choice to save on costs and time. When more than six will be coming for dinner I make two pans of this recipe and bake them side by side. Cooking time, of course, will be a little longer. The wonderful thing about this dish is the longer it bakes sealed up, the more tender it will be. If you are concerned there might not be enough meat in your recipe for everyone, here is a good tip. Add some bite size pieces of portobello mushrooms. 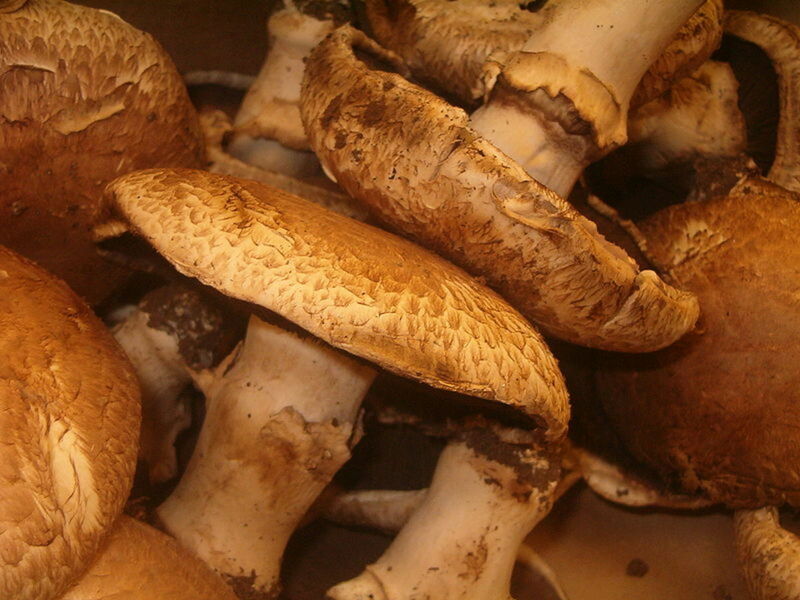 These mushrooms are darker in color than the common white mushrooms and have a meaty texture and taste. I have a large family and sometimes have saved on meat costs by using the portobello mushroom -- and, it is delicious. Line the baking dish with enough foil to fold back over the meat and seal tightly. Place margarine in center of foil and spread around. Drain and chop tomatoes -- save the juice and set aside. Cut the steaks into smaller serving size pieces and rub with seasonings. Arrange steaks in slightly overlapping layer. Mix steak sauce with the tomato juice and cornstarch. 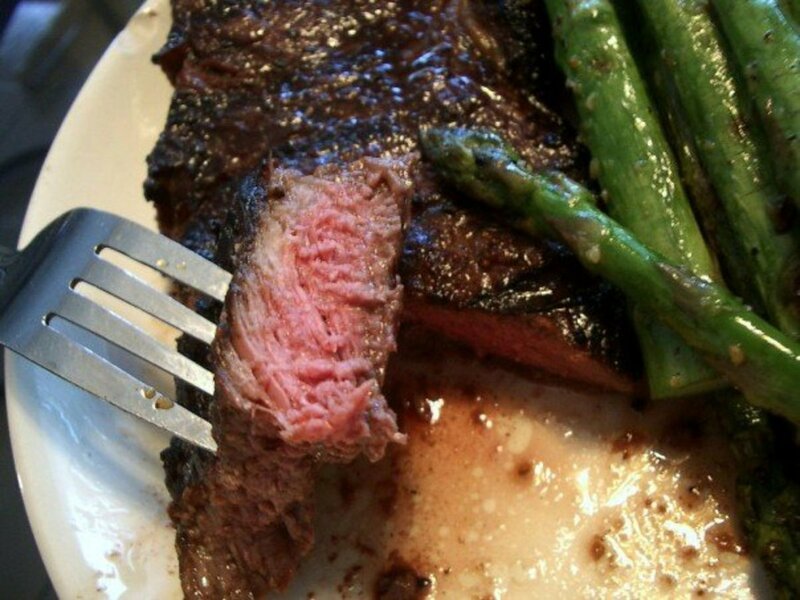 Sprinkle all other ingredients over steak then pour juice over all. Fold the foil over and seal tightly so no steam will escape. Bake at 375 degrees for at least two hours. I have sometimes doubled this recipe. When doing so, I bake it for at least four hours. Remove from oven and let rest while preparing mashed potatoes or rice. When ready to serve, carefully peel back foil and roll it down. The steam will escape and will be very hot, so be careful not to burn yourself. Burns from steam can be very painful. Place dish on bread board or hot pads on table and watch those steaks disappear. Serve with warm dinner rolls or garlic bread to soak up the juices. This is a really great supper for chilly winter evenings. I serve this recipe with mashed potatoes, a green salad with vinegar and oil dressing, and garlic bread. My first attempt with this recipe produced a surprisingly amazing and delicious result. After moving back to the Pacific Northwest from California, we stayed with one of my brothers and his wife till I had found a job and was able to support my daughter and myself. I had recently moved into my own place, a darling two bedroom duplex, which was perfect for just the two of us. My brother's birthday was coming up and I wanted to do something special for him, though I had little money. I thought about just having potato salad and barbecued burgers or hot dogs, so, went shopping with that in mind. At the store, I went to the fresh meats department first. I had decided to just get ground beef and barbecue up some burgers. I saw that the chuck steaks were on sale and it was a good price. They were large and I thought if I got six, I could cut them in half and serve them with baked potatoes, salad and garlic bread. The only problem was that I knew chuck steak could be pretty tough and hard to chew. As I stood there looking at them, the clerk behind the counter came over to serve me. I asked him to pick out the best six and largest steaks for me. I also asked him if there was a way to make them more tender when I cooked them. He told me the recipe his wife used and I wrote down the ingredients. I already had most of the ingredients at home. All I had to buy was the canned tomatoes and heavy duty aluminum foil. 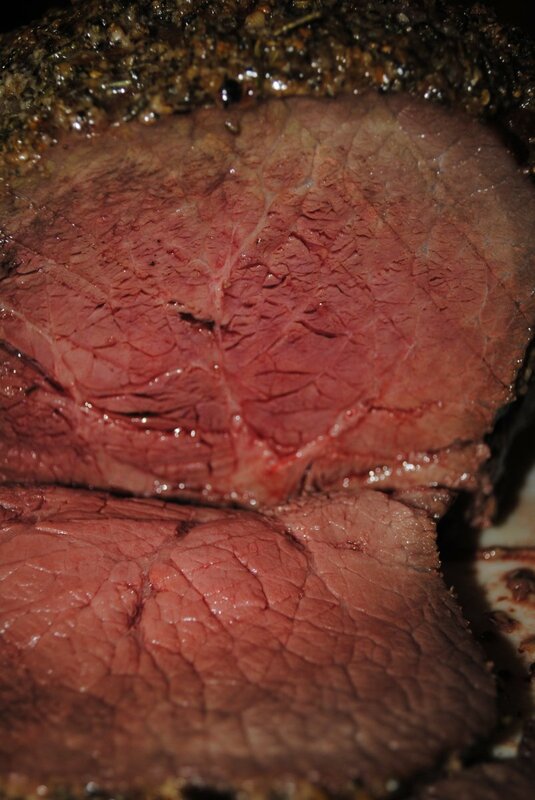 I followed the recipe the meat man gave me and was amazed at the results, so was everyone else. I had made mashed potatoes to go with the meat platter and every bit of that dinner was gone in no time. Hi Peggy. It is a great recipe and yes, easily tweaked. One man even tried it with venison and loved it. So glad you enjoyed the article and hope you try it soon. Let me know how your version turns out. Thank you for reading and commenting. This sounds like an excellent recipe and one that could be easily tweaked to suit individual tastes. Thanks for posting this! Hi Mary. I love this recipe because it is so versatile and easy to tweak. Your version sounds great. Thank you for reading and sharing your version. Dear Phyllis, Thank you for a lovely dish. I had to tweak a little, used tomatoes with chili's, mild, added Pinot Noir to make up the balance of liquid. Added 1/2 inch diced potatoes. But even my 'picky eater ate it! Thank you again for and affordable, go to meal. I prepped night before and put in oven for 30 mins extra when I left to get kids after school and their stuff. The house smelled awesome when we came home to a hot, ready meal. Husband happy. Thank you! 20 months ago from High desert of Nevada. Hi Bill. Thanks for reading and commenting. I think you will really like this dish. It is very versatile for vegetable options. It is the tomatoes and liquids that are most important. Enjoy! A nice change of pace. I hate tough steak, so thanks for the tips. Now I have to get myself to the supermarket. 22 months ago from High desert of Nevada. Fantastic, Susanne.Thanks for reading and trying the recipe. It is about time I fix it again, it's been awhile. It's in the oven cooking right now...looking forward to tasting the results! Smells fabulous ! 23 months ago from High desert of Nevada. Hi Susanna. Thank you very much for sharing some great ideas with the recipes. So glad you like my recipes. My Dad grew all our vegetables and fruits, plus we had eggs every day from our laying hens, chicken from the fryers, and a side each once a year of beef and pork Dad kept in a rented locker. I do not have any more recipes on HubPages. I used to have a lot - I will look them up and post some. My Dad also grew the Three Sisters (corn, string beans and squash), so we had succotash once in awhile, so good. Native Americans called them the Three Sisters because they supported each other. The string beans had the corn stalks to grow on and the squash had large leaves to protect the roots and conserve moisture in the soil. They were always planted together. Thanks again for reading and commenting. Wow, did this bring back memories of the amazing family dinners we had around the table, especially on Sunday's after church. I remember hoping that one of us children would be asked to offer the blessing on the food so we could dig in quicker. I grew up on a small farm and orchard in the backyard. My German immigrant parents raised and grew everything that went on the dinner table. We rarely used anything from a store. We raised our own beef, so this cut of meat was served quite often. My mother actually cooked both of your recipes but she also added celery, quartered onion, and mushroom soup. We ate our roast with either homemade or Knorr brand German potato dumplings called "Klose" alongside German red cooked sweet, sour cabbage called "Rot Kohl" with a hint of cloves.Mom also added a touch of crushed Cumin seed to the water which made it take on a totally different flavor. Daddy was a baker so we always had fresh rye bread to sop up the gravy with. Those are such special memories of great family meals that I have tried to carry forward with my children and grandchildren. I am trying to find other recipes you have posted. Could you give us a link? Thank you so much for sharing your special memories and recipes with us! Hi Teddie. It is so good. Thanks for reading and commenting. Yes. Put all ingredients in the foil. Thanks for reading and asking, Karyl. DO WE PUT THE JUICES IN THE FOIL? 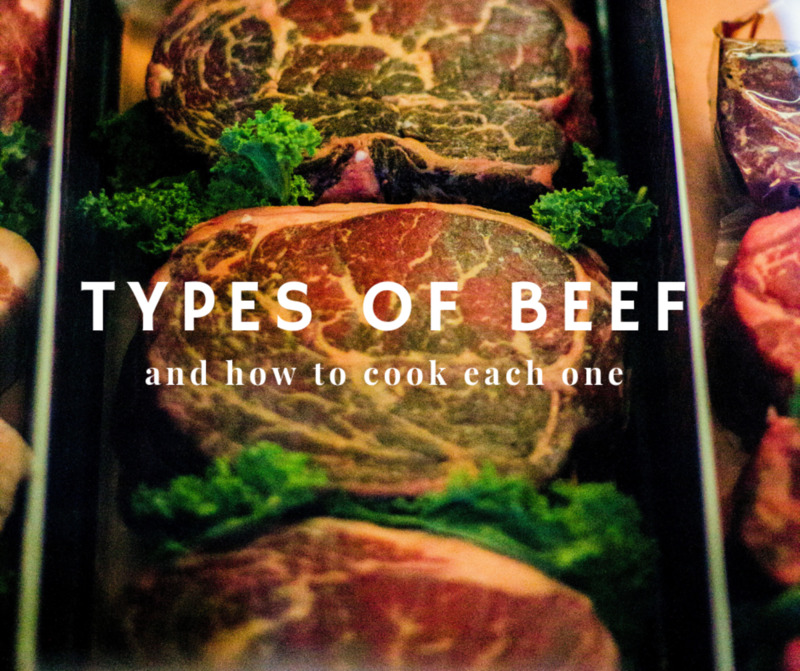 "Sprinkle all (includes tomatoes) other ingredients over steak then pour juice over all." Trying recipe tonight all you said was drain and chop tomatoes and save the juice which you pour over everything later but what did you do with the tomatoes??? It doesn't state!? Hi Rick. One of the greatest inventions ever - our faithful cast iron pots and lids. I will try that next time. Thanks for sharing that tip. Thanks for reading and commenting, Rick. Hi esmonaco. You are most welcome. Good to hear from you. 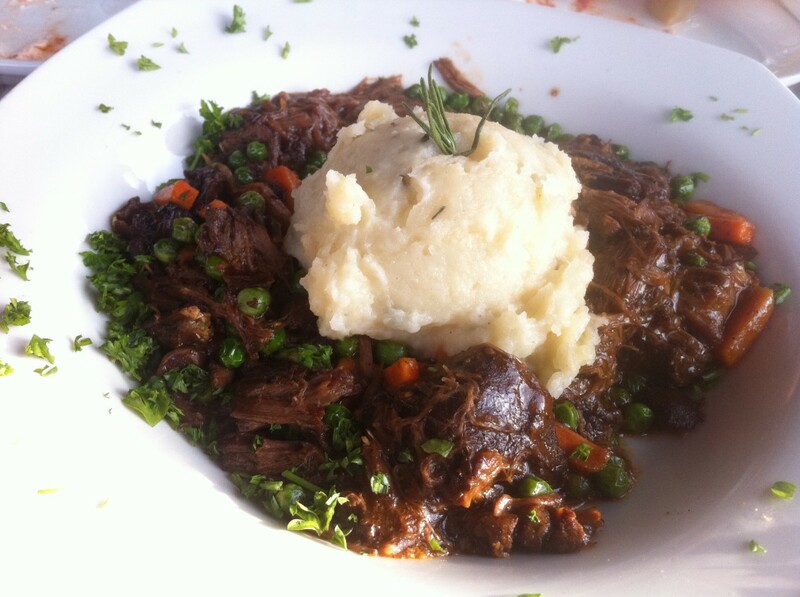 Your mother sure knew how to do chuck roast - I can almost taste it. Cooking chuck roast or chuck steak with tomatoes or tomato sauce really tenderizes the meat a lot. Thanks for reading and commenting. Hi Mary. Chuck steak is so good when cooked right. By sealing it in the foil it steams and gets so tender. This recipe is very versatile with the ingredients. I am sure you will like it this way. Thanks a lot, Mary, for your ever faithful support and votes. Hi Patsybell. Yes, the Portabella mushrooms are so good. Thank you so much for the visit, comment, votes and shares. I'm embarrassed to admit I've never cooked a chuck steak! Like so many I was afraid of its texture and put off by all the fat. This recipe, however, could change all that. Well done my friend. Phyllis, I agree with you, chuck steak is a delicious cut of meat, your recipe sure sounds wonderful. I'll be giving this a try soon, my mother always added a chuck roast to her tomato sauce for pasta, and it was always melt in your mouth delicious after cooking in the sauce all day. Thanks for the recipe. Mushrooms. Great idea. I always enjoy your posts. Voted up, U, I, Tweet Pin. You are most welcome, Felicia. Thank you for reading and commenting. Im a single mom of three fast growing children, 9, 12, and 16. I'm always looking for a good, economical way to feed my family a good meal. This sounds like a winner. I can't wait to try it. Thanks for the recipe. Hi Carrie. I bet that was very good with the squash. I will have to try that -- thanks for the great idea. And thank you for reading and commenting. First search result - so I tried it. Great result! Didn't have any mushrooms but had lots of home-grown squash & zucchini, so substituted zucchini for the mushrooms & it came out really good! Thanks, Carrie. It is one of my family's favorite suppers. Ken, thanks so much for stopping by. It is always good to see your pic and read your words. I think you might like the chuck steak bake. I, too, rarely eat red meats -- but, this is sooo tender and tasty. If cooked long enough, it just melts in the mouth. And it makes a wonderful gravy for mashed potatoes. Hugs and may you walk in peace. Sally, thank you so much for stopping by and for your comments. Every time I make this meal, there are no leftovers. My family loves it and it is so easy. You are so right about chuck steak, Phyllis. It is delicious but too often overlooked because it is entirely too chewy unless cooked poperly. I love the way this recipe sounds and will be sure to try it soon. Beef and cooked tomatoes are a fabulous combination! Hi Deb. Nice to see you here. Thanks for stopping by. I imagine this recipe would work well in the crock pot. I have never tried it that way. Sounds yummy. I might try this in the crock pot.